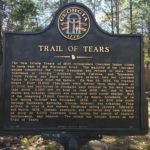 This past summer I was praying over our state and reading about the Cherokee Removal Act which led to the Trail of Tears. I started to cry. I don’t cry over hardly anything but this came from deep inside me. I believe my spirit man was picking up that this was something that still grieved the Lord. 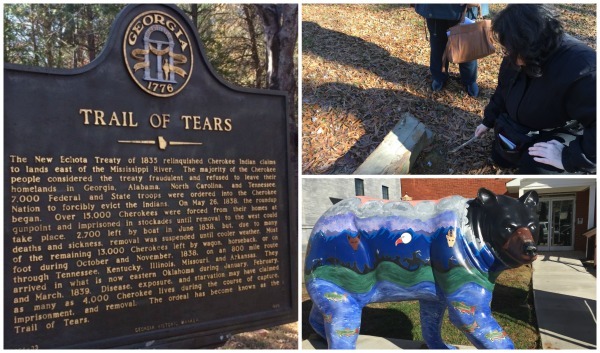 I told Yvonne about it and said we may need to take a team to Murphy, NC which is where the Trail of Tears started in our state. This was around July and the only time we could all put it on our calendars was December 28-29. I was a little disappointed we couldn’t work it out to go sooner because most of these things are time sensitive. Nevertheless, that’s the best we could do. I started the research. 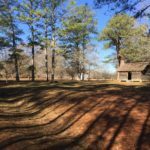 I found that someone (William Holland Thomas) had bought some land in North Carolina for the Cherokee to stay on and not be removed. I had never heard of it before and thought that was profound. I knew we needed to pray into that and call forward the blessing of it. 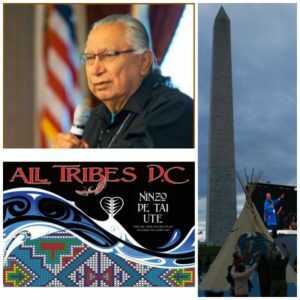 Then in October I heard that Neigel Bigpond was gathering other tribal leaders in Washington DC (All Tribes DC) to forgive the US government for all we have done to the Native Americans. This was stunning news. We have not kept one single treaty with them. Not ONE. But Neigel Bigpond understood the power of forgiveness. It breaks the hold Satan has on a situation. Satan loses his legal right when we release forgiveness to someone. This was not something born of flesh. No human would want to forgive us for all that we have done to their people, their culture, their land. Furthermore, we weren’t asking for forgiveness. No, this was straight from the Spirit of God. I can’t begin to tell you how significant this is in the history of our country. I believe we will look back on it years from now as a pivotal moment in the direction of our nation. I wanted to be in DC when I saw what was going to transpire so bad. However, I had already signed up for a conference in Texas and finally came to peace that it was not my assignment to be there. If ever there was an occasion where I would have liked to have be a fly on the wall, that was it. As time drew near for our team to go to Murphy, NC I looked for my notes. They were gone. I had a computer problem earlier and I think they got wiped out. Shoot, we were leaving in a couple days and I couldn’t find anything I had already researched. I had to start over. There is much written about the subject and I needed to find the nuggets the Lord had as to what our specific assignment was. 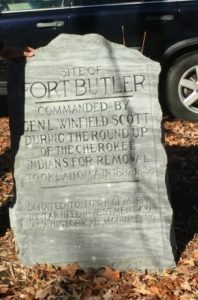 Murphy, NC used to be Fort Butler. 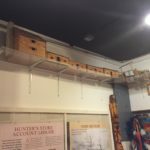 This is one of several Forts that were built to collect the Cherokee before removing them to Oklahoma. I knew we needed to go there and repent for that. 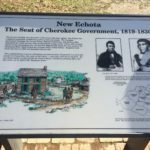 In my reading I found the treaty that gave permission for the Cherokee Removal was signed in New Echota about an hour and a half further down the road . AND it was signed on December 29th – we could actually be there on the anniversary of the signing of that treaty! Oh the timing and providence of the Lord! Had I not lost my original notes, I may not have found that piece of information. And had we not been delayed in making this trip… All things work together for good. 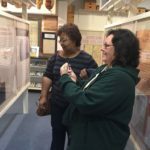 We arrived at the Cherokee Historical Museum on December 28th where we met Wanda, the curator. 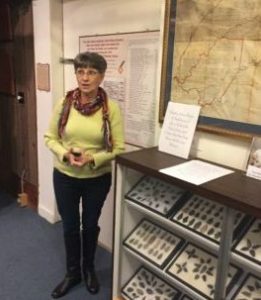 We asked her if she knew anything about the Cherokee and the lost tribes of Israel. She said no but that Perry Stone was there recently and stayed for 3 weeks studying that. What? 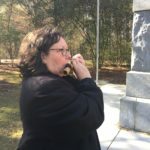 She also told us there was another man who had a tent pitched nearby who was praying for revival because some believe the Cherokee will play a role in igniting the next major awakening. Wow! 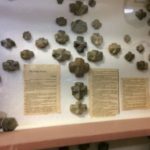 We spent some time in the museum and prayed as we walked among the exhibits. 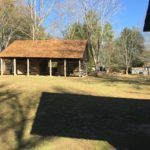 The next day, December 29th, we went to New Echota, GA. 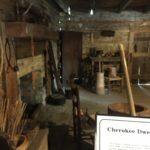 This was the capitol of the Cherokee nation. 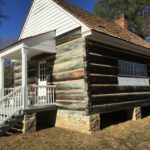 They had log homes, a printing shop, a council building and a supreme court building. 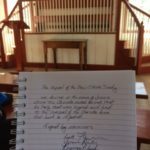 There was also a missionary who lived there and a replica of his home was also on the site. They were a thriving community. Many of them had converted to Christianity. 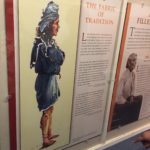 In the museum there is a recording of someone singing Amazing Grace in Cherokee. Their language was written down and they were quite advanced as a people group. 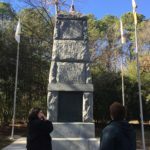 Unfortunately gold was found in Georgia and the settlers wanted the Cherokee removed from their land so they could have the resource to themselves. 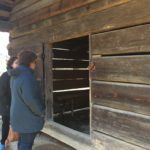 We sat in the Supreme Courthouse at New Echota and prayed. It came to me that if something could be ratified, it could also be repealed. So I wrote out a repeal of the treaty. The three of us signed it. 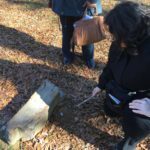 Then we walked over to the site of the house that belonged to Elias Boudinot where the original treaty was signed. 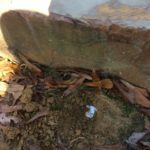 There are stones marking the corners of the house where it originally stood. 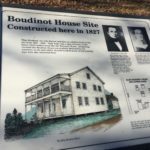 We felt it was significant that Boudinot’s house had not been rebuilt since he was one of the treasonous signers of the treaty. We went to a cornerstone and buried the repeal. While we were doing this my phone rang. We were in the middle of nowhere and had no phone reception to send text or photos. So when it rang I felt compelled to take the call. It was from a builder named Stone I had called weeks earlier about a project. He apologized about not calling back sooner but he just got the message. I later found out he is no longer building. I think this was just the Lord’s way of underscoring what we were praying. 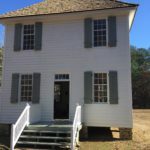 It was as if the Lord was saying this house cannot be rebuilt because it led to the harm of My people the Cherokee. Sealing it all with a sound! We believe the Cherokee will be restored to their inheritance. 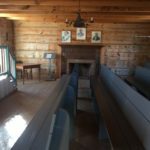 Not necessarily in the form of reclaiming that specific land but recompense that may come in an array of forms such as witty inventions, curing diseases, and/or bringing revival. They carry a great heritage and we would all benefit from their influence!